Graham Westley says he does not listen to any criticism of his appointment as Peterborough United manager from "people without names or faces". The 47-year-old, who left Stevenage in May after a third spell, was named as Dave Robertson's successor at League One Posh on Monday. "What I pay attention to is people from Stevenage saying good luck, thank you for everything you've done," he said. Westley took Stevenage from non-league to League One in his second stint. Speaking to BBC Look East, he added: "Nowadays there's plenty of opportunity for people without names or faces to have opinions. "I don't pay attention to those kind of things." Westley, who managed Preston North End between his most recent Stevenage spells, was given the ABAX Stadium post after a 15-hour meeting with Posh chairman Darragh MacAnthony in the United States. On announcing the appointment, MacAnthony released a statement saying he did not judge Westley on "his apparent obsession with fitness and physicality over style, flair and fast free-flowing football" from his time at Preston. Westley pointed to the positive reaction he enjoyed while at Stevenage. "It was very enjoyable for us to listen to managers week after week talk about the big, strong Stevenage side they were about to play when we had three or four lads who were 5ft 7ins," he said. "And we used to put the ball on the floor and we used to pass it, score goals and win games, and people would wonder how on earth it happened. There's a lot of myths around everybody, but in the end my Peterborough side will be judged on how it plays, the way it performs and the results it gets." 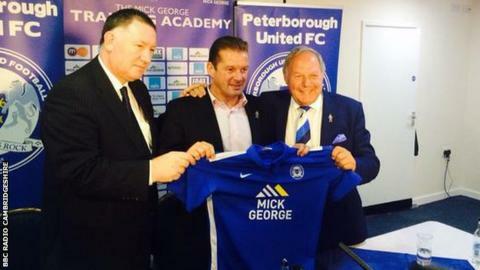 He added that Peterborough wanted "football played the right way". "It's as important to the fans that the ball is on the floor and passed 500, 600 or 700 times a game as it is that the result comes out," he said. "But in the end you've got to win games, score goals, and play the game the right way to succeed. "The club is adamant and determined about everything it stands for and it's really exciting to be a part of it." Meanwhile, Posh have extended the loan spell of 20-year-old Leicester City defender Callum Elder until 4 January.